Ever wanted to ride through Ireland or Scotland on a Harley Davidson – wind in your face – scenery all around ? Well now you can ! 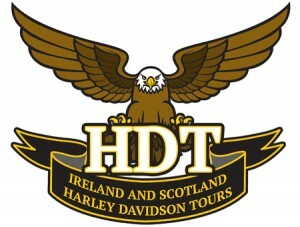 Our experienced Harley Davidson tour guide “Colin McLearnon” can make it happen. He has developed several tours that should give our guests the ultimate experience. The Harley Davidsons are supplied, as is the fuel, and of course the insurance. All hotels are also included as are entrances to the sites on the itinerary. Just live your dream and let us make it happen! Arrive in Belfast (we can collect you from Dublin airport easily) and stay for 2 nights at the Europa Hotel. Visit the Titanic museum and the famous Crown Liquor Saloon while in Belfast. Collect your Harley-Davidsons and take a spin up the North Coast (amongst the top ten coastal drives in the world). Visit the Giants Causeway and Dunluce Castle. Stop for lunch at Ballintoy Harbour (the film location for “Game of Thrones”). Ride West via Enniskillen, Benbulben, and Sligo to Ballynahinch Castle for 2 nights. An easy ride to Kylemore Abbey and through Connemara National Park. On the road again to visit Aughnanure Castle before riding through the Burren to the Cliffs of Moher. Then on to Kenmare and stay 2 nights at Sheen Falls Lodge. We can either tour the Dingle Peninsula or the Ring of Beara. Often the sea mists will decide ! Today is a longer ride via the Rock of Cashel to Dublin. Stay in the Trinity City Hotel for 2 nights. Take a day away from the bikes and enjoy Dublin. Visit the Book of Kells, Guinness Storehouse, Temple Bar, and try the Viking Splash Tour ! An early start as we ride up to Belfast to catch the ferry to Scotland. We travel in the Executive Lounge of course. Then through Scotland to Cameron House on the banks of Loch Lomond for 1 night. Ride through Glencoe and past Ben Nevis deep into the Highlands. Arrive in Inverness and stay for 2 nights at the Loch Ness Country House Hotel. Mostly a day without the bikes as we enjoy a cruise on Loch Ness and a visit to Urquhart Castle. A longer ride with stunning scenery as we travel through the Cairngorm mountain range to Edinburgh for 2 nights at the George Hotel. A day without the bikes to explore Edinburgh and visit the famous and spectacular castle. Sadly the end of the tour where we ride to the ferry and return to Belfast. Transfer to your flights or hotel (should you be staying on) and reflect on a truly great ride through Ireland and Scotland.